I would rate our stay here with 4 stars. The best thing about this resort is that it's so intimate. Even though there are other vacationers there, we felt as if we were the only ones there! And the beaches and sunsets are absolutely breathtaking! Least favorite thing was probably the price of things like sunblock or little things that you need along the way. One bottle of sunscreen cost us $30! Make sure you come with plenty of your own sunscreen and other items like cigarettes, band-aids, feminine products and such because the cost to buy them at the resort is outrageous! And definitely stay for at least 5 nights, you need a good 5 days to really relax after getting in and out of customs at the airport. Thanks for including your beautiful destination wedding photos! Future readers will love getting an idea of what their photos could look like if they choose Couples Swept Away in Negril Jamaica! Check out more reviews at TripAdvisor. What were your favorite things about the Negril Jamaica all inclusive? The people are what make Couples Swept Away(and island) fantastic. The atmoshpere, food, service and desire to get it right the first time are great as well. Enjoy your time, get to know the staff and relax. 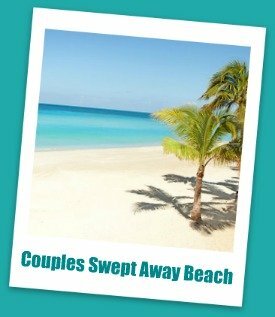 Couples Swept Away gets a 88% recommendation rate from travel reviews. See TripAdvisor for to read more reviews of this Negril Couples Resort. Also check out our overview of Couples Resort Jamaica and our Romantic Travel Destinations for more details about Jamaica and adult only all inclusives! What were your favorite things about the Caribbean all inclusive resort? The food, the beach, the entertainment staff. Unlike many of the other All Inclusive Resorts we go to, Couples doesn't offer 24 hour room service. I can honestly say that was the only thing I felt it was missing. Definitely take the catamaran cruise and enjoy the slide, or make it a point to jump off the high cliff, it's a serious rush. You can find more Couples Swept Away reviews at TripAdvisor. Also check out our All Inclusive Romantic Travel Destinations page for more information about romantic adult only all inclusives! What were your favorite things about the all inclusive resort? Enjoy-it's fantastic! Go hungry, prepare to walk a good bit to get from end to end of the resort, if you are a pool person look elsewhere-the pools are great but quiet and not a "party hub"
Couples Swept Away gets a 88% travel review recommendation. See TripAdvisor for more reviews of this Couples Swept Away Resort. You might also be interested in our Most Romantic Travel Destinations page. What were your favorite things about the Negril Couples resort? The staff, excellent food, funky chic Caribbean decor, the beach. Once you go, you know. Some people are put off by Jamaica, don't be, I have been there over 20 times, and it has always been great. With an 88% approval rating from previous guests, Couples Swept Away in Negril Jamaica gives many couples a great romantic getaway. Check out the gorgeous beach! You can find more detailed information and more travel reviews on Couples Swept Away on TripAdvisor. You might also want to read our Couples Resort Jamaica page. Check out our Romantic Travel Destinations page for more great couples all inclusive vacations.